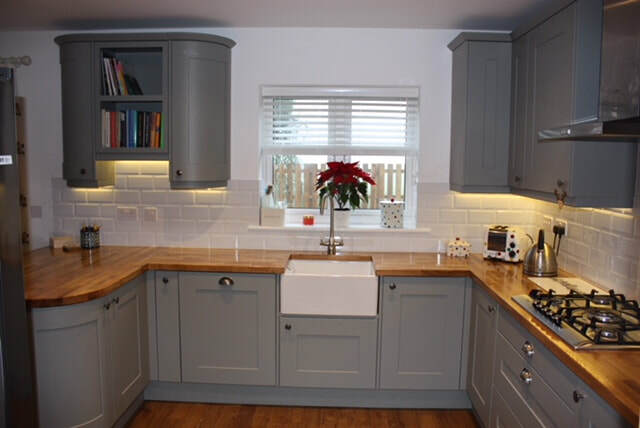 We know our lovely customers from Wiltshire well, we also know that creating that stunning country kitchen can change the way you and your family live. In this case, we were asked to transform a high gloss kitchen into something more country and traditional but with the mod cons you would expect. 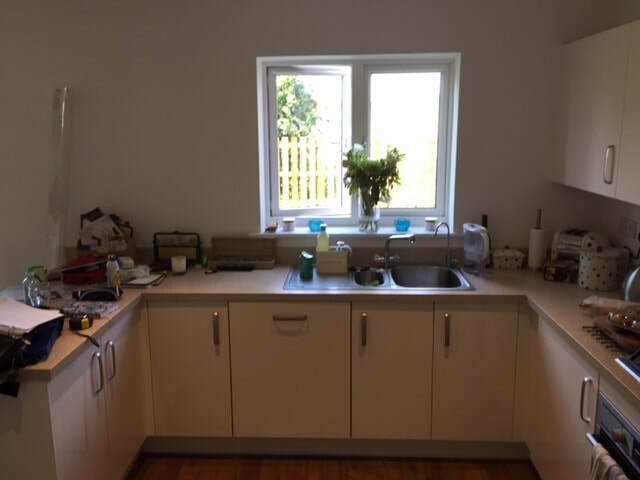 If you see the pictures below you can see the three before images of the high gloss kitchen. 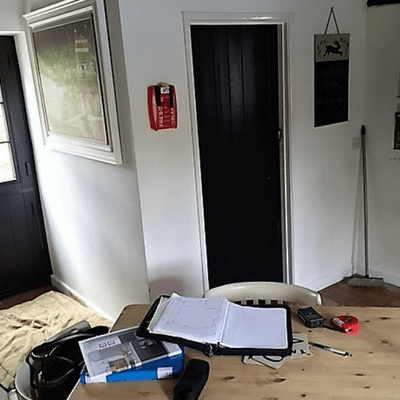 We then discussed with our customer what was required and began to design a kitchen to their taste and functionality needs. 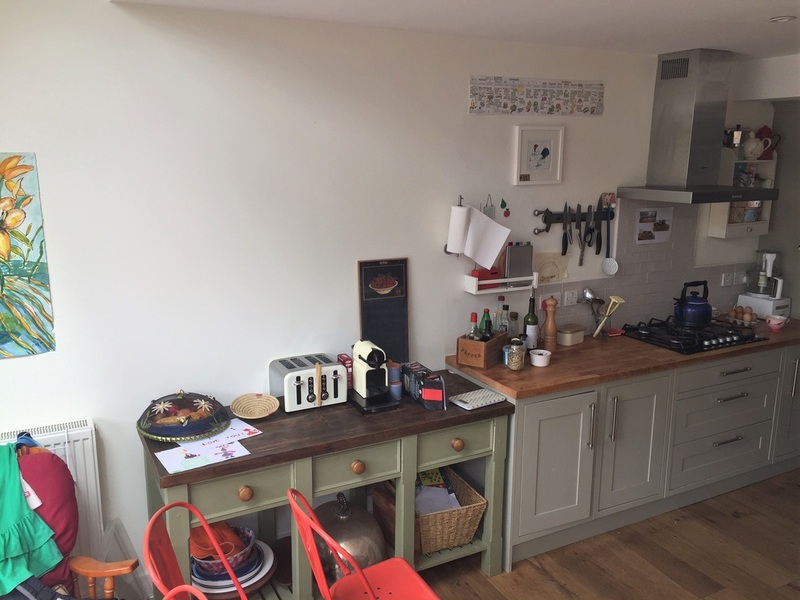 The kitchen worktops are solid wood and perfect for the more advanced chef, with painted kitchen doors that really bring out the style. 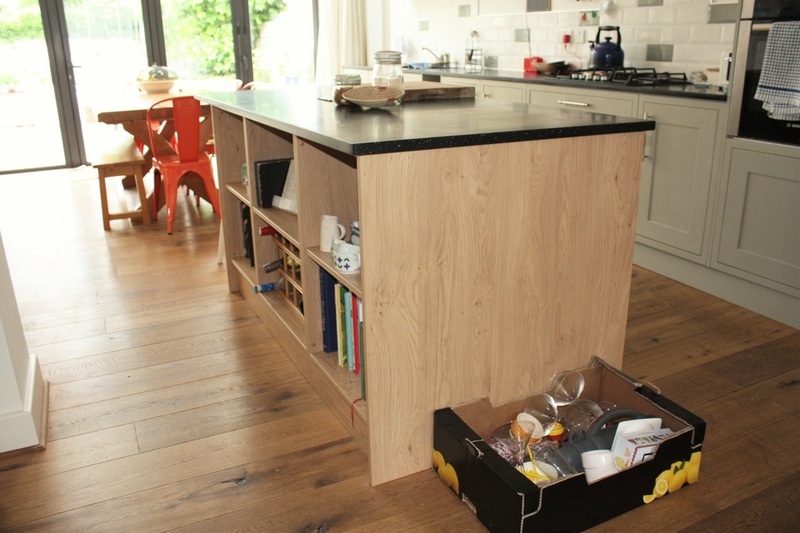 We also installed some curved units to create a softer look and compliment the solid oak worktops. Then to finish off we added a belfast sink to give it the full country look. Please click the images below to see the full before and after images. If you are looking for a kitchen makeover in Wiltshire, Bournemouth and Dorset, then speak to us today for a free no obligation chat. 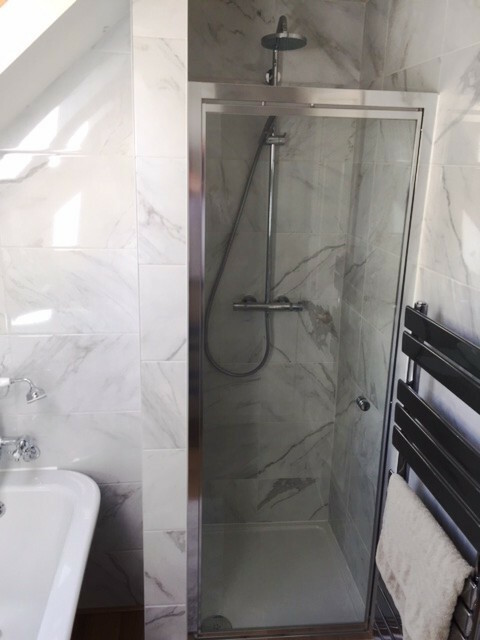 This was originally a bathroom and our customers from Fordingbridge who were on a tight budget needed a shower room and a seat. 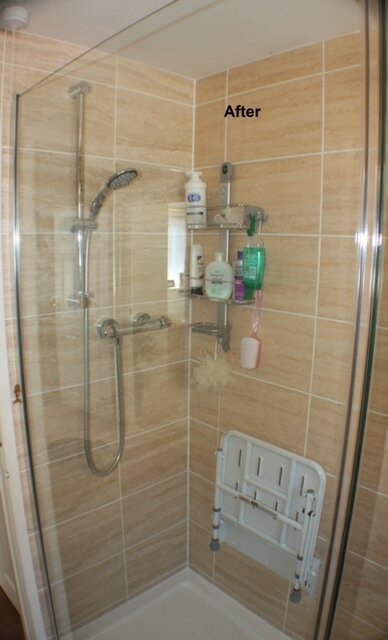 We were able to replace the bath with a new shower tray and screen. ​We were able to build a useful seat over some original plumbing. 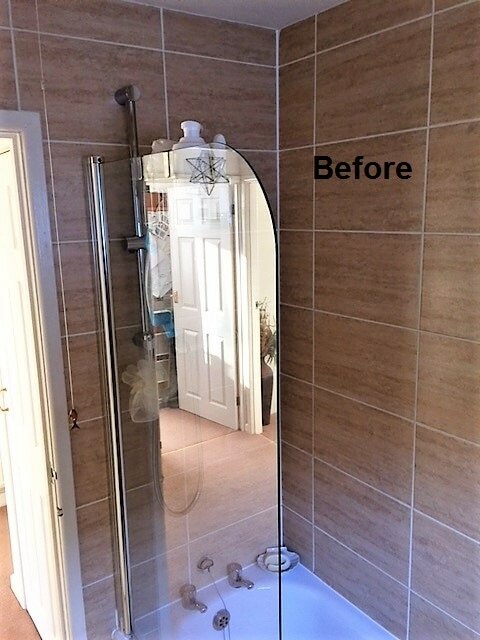 We sourced the original tiles and added to the existing tiles to complete a practical and serviceable room with a fresh new look. ​So why not get in touch with Brian's Kitchens for your very own Bathroom Installation in Fordingbridge. 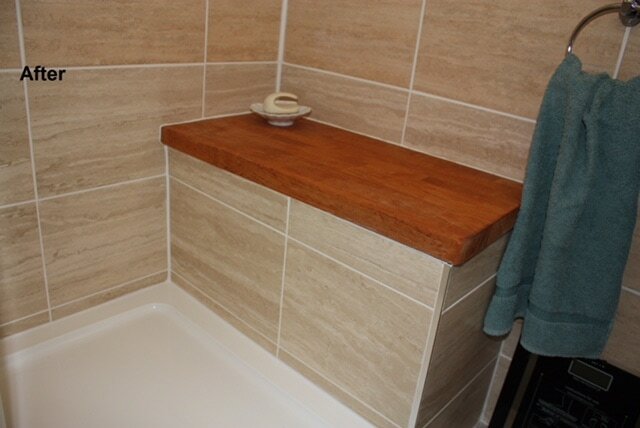 Take a look at this recently installed Bathroom in Hightown. We started to remove the existing Bathroom, taking out the plaster board and replacing the timbers in the wall. 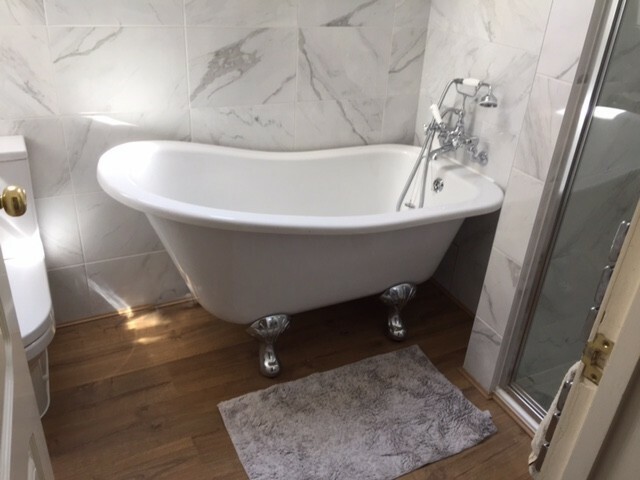 We then re boarded and fitted a complete new bathroom which consisted of a Freestanding roll top bath, traditional taps and matching shower head integrated into the wall. 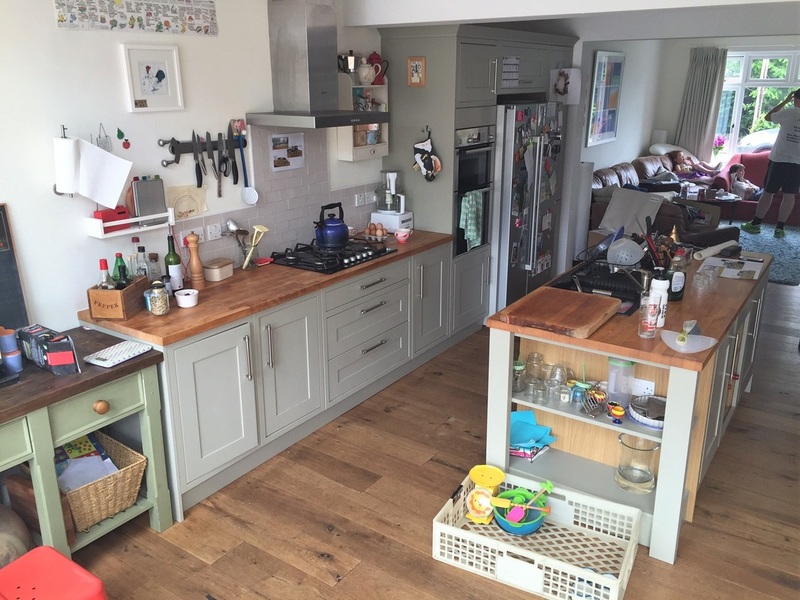 See the difference Brian's Kitchens can make to your vey own home today! Brians Kitchens have just recently carried out a Double Sink bathroom Installation in the Ringwood area. 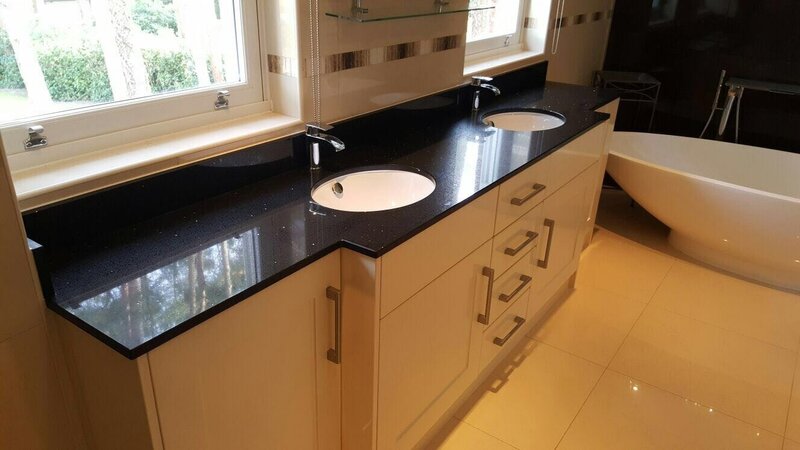 This recent Bathroom Installation consists of two Bathroom Sinks mounted underneath a solid Granite Worktop. 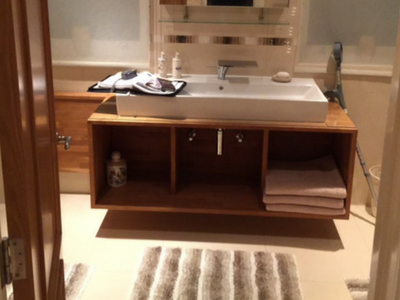 The Sink Unit has been designed so that each sink has its own cupboards and drawers built into the unit. 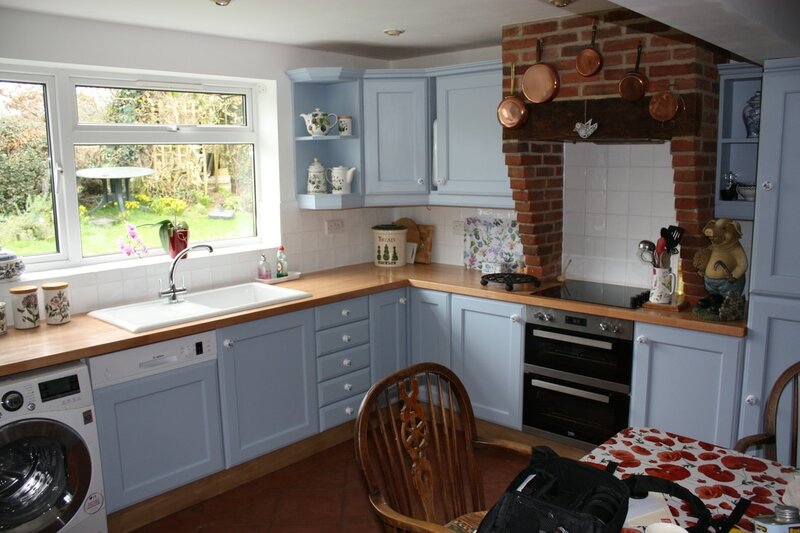 ​Take a look through the images below and see the difference Brians Kitchens can make your very own home. Brian's Kitchens are pleased to be members of Checkatrade. ​Brian's Kitchens are pleased to be members of Checkatrade. Before going ahead with home projects people like to research companies to see how reliable they are, no one likes a cowboy. At Checkatrade you can read reviews or indeed write your own review. All reviews are genuine and verified by Checkatrade themselves. We are building up our profile and working hard to get 10/10.....9.7 is our average rating so far which is an amazing start. Take a look at the difference Brian's Kitchens of Whitsbury can make to your very own Kitchen. This Kitchen has designed using solid materials and the latest appliances. A Happy New Year to all customers past, present and future. A Happy New Year to all customers past, present and future. 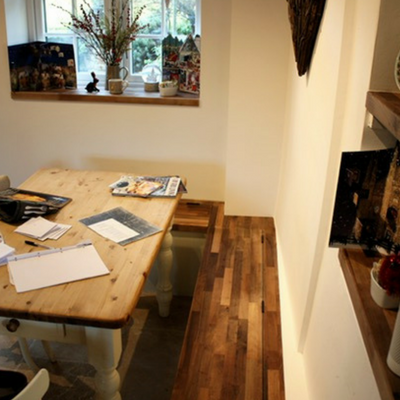 We have a busy start to the New Year here at Brian's Kitchens. A lot of people are choosing to update their homes rather than moving house. 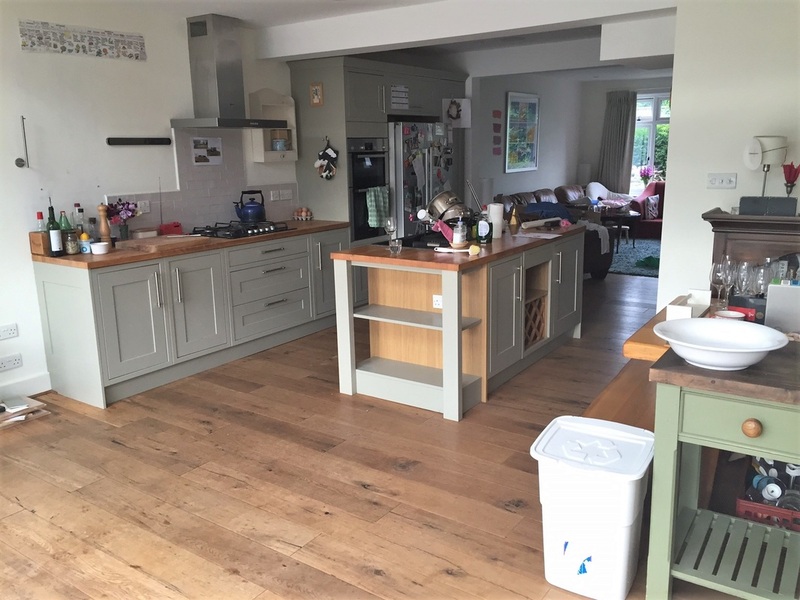 One customer from Alderholt has removed their kitchen pantry, enlarged the existing window that was inside the pantry and created a lovely family eating area with opening walnut top bench seats for seating and storage. This was a small dark kitchen in Downton Wiltshire. 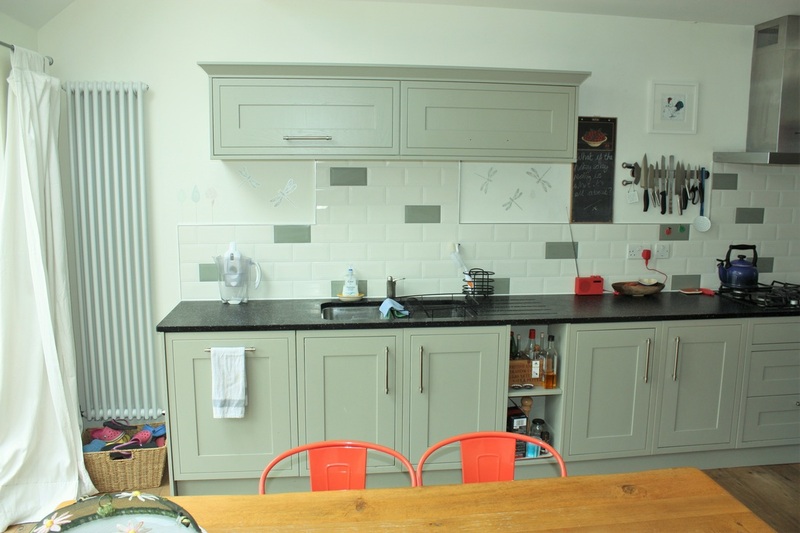 The old Kitchen has now been given a face lift replacing all the carcasses, cupboard doors and handles using stone coloured door and carcasses finish. 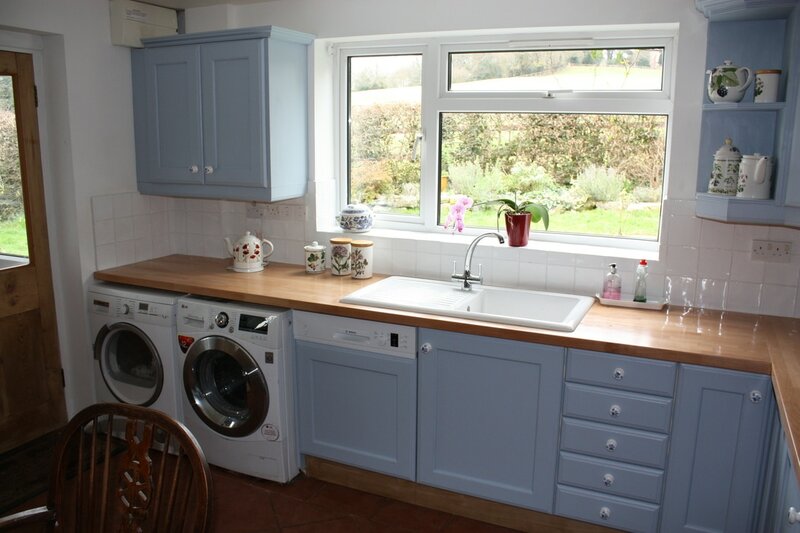 We used a dark Melamine work top and a granite sink to compliment the units. 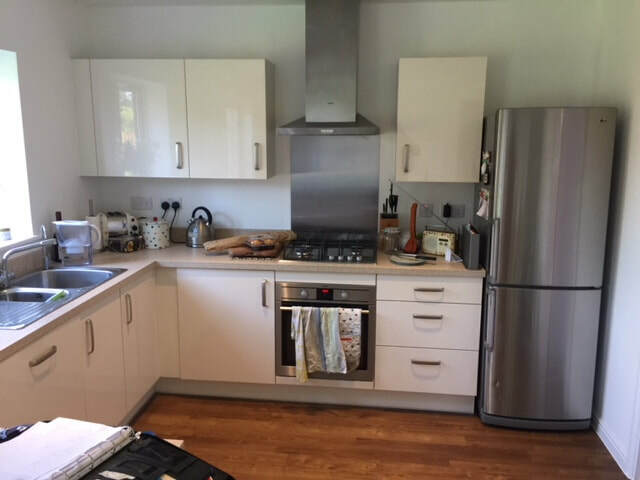 This newly fitted Kitchen was designed to save space within a small area with an integrated cooker and fitted above waste height creating a much easier cooking space. You don't always need to have a brand new kitchen to achieve the look that you want for your kitchen. You just need Brians Kitchens to give you guidance. 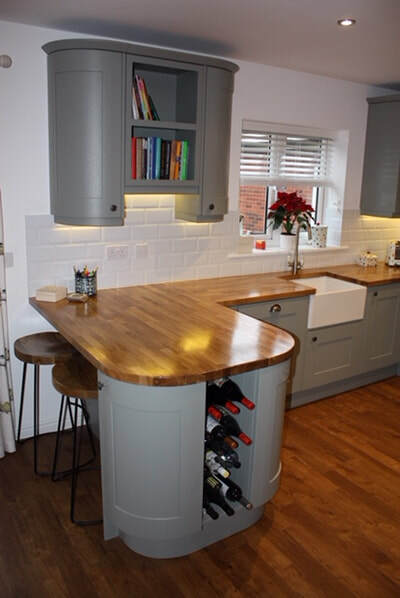 We sent a week at a lovely customers house in Wimborne recycled an existing island unit which originally housed the sink to create a new look. 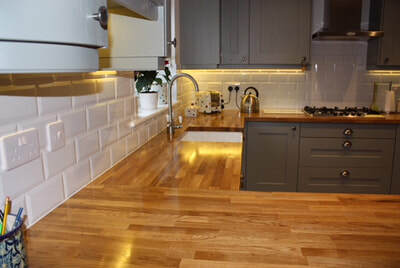 The island unit was used to make a long run to house the original hob and new under mounted sink. 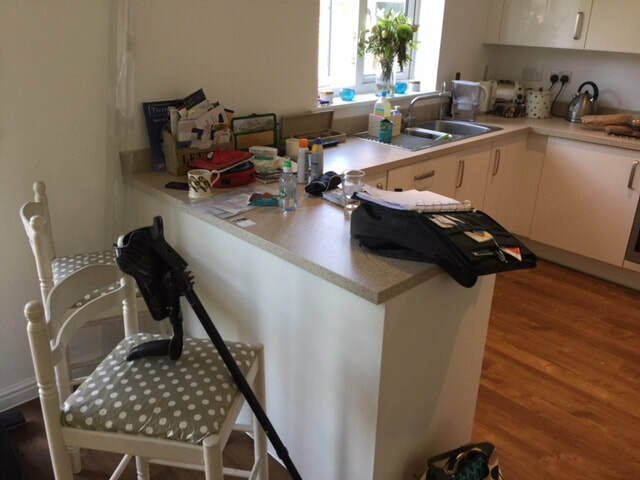 We then replaced the beech worktop with black Granite Minerva creating a sleek, solid, long work surface. 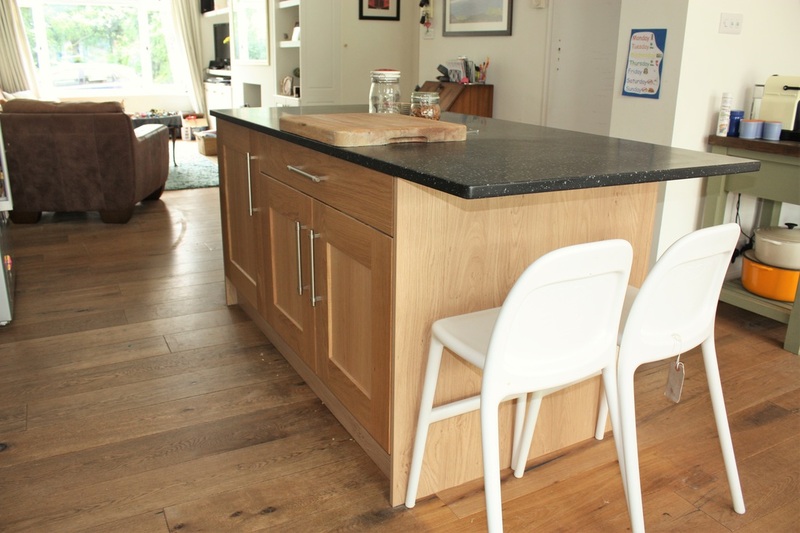 We complimented the new look with a new oak island unit complete with Black Granite Minerva Work surface. The plumbing and electrics were updated and the walls retiled. Brian's Kitchen can provide all the latest accessories for your new or existing Kitchen, so why not add colour and bring your Kitchen to life with this new Colourful tap. ​Bring the vibrant colour of the Rio Olympics to your kitchen. This tap is available in many different colours to choose from. These taps would be an asset to any Kitchen, so get in touch with us today and see what other Kitchen Accessories can make a difference. 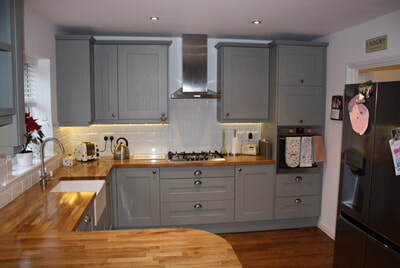 Expert kitchen and bathroom fitter and designer with years of experience and countless personal testimonials from past customers.